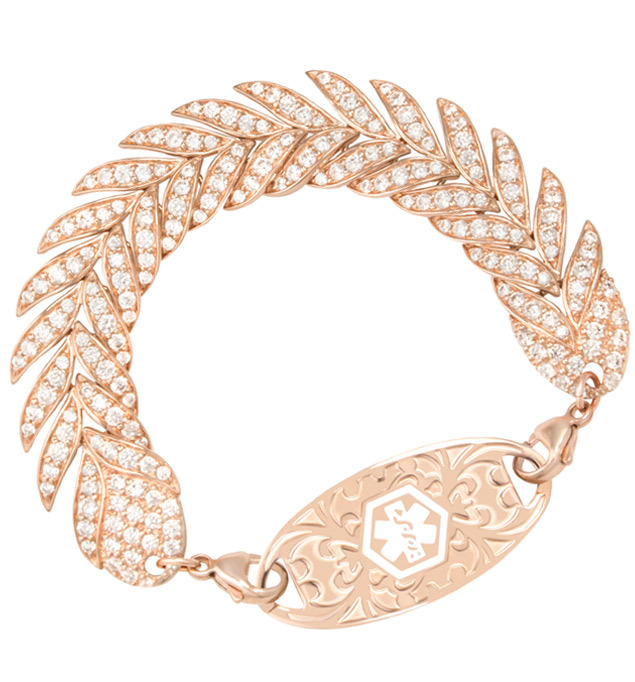 A stunning statement piece you’ll love to wear, our Rose Gold Feather Medical ID Bracelet has a retro feel with a gorgeous on-trend rose gold finish. This rose-gold-dipped sterling silver design sparkles with pave-set Cubic Zirconias. Paired with your favorite rose gold tone medical ID tag, the Gold Feather Medical ID is the perfect finishing touch for an impeccably polished look. As with all of our interchangeable designs, you can wear your Rose Gold Feather Medical ID Bracelet with any custom-engraved Lauren’s Hope medical ID tag, keeping what’s truly most important to you right at hand. This on-trend med ID is a great choice whether you wear your medical alert bracelet for epilepsy, lupus, hypothyroidism, Alzheimer’s, vision impairment, or any other medical condition or treatment consideration. Custom engraving allows you to choose the look you want so you can stay safe in style. USPS Priority | $15.00 Est. Delivery Thursday, April 25 << Ships next business day! USPS International Priority | $45.00 Est. Delivery Monday, May 6 << Ships next business day!